As some of you may know, I was currently halfway around the world in Siem Reap, Cambodia for two weeks taking part in VMware's Good Gigs Trek hosted by the VMware Foundation. 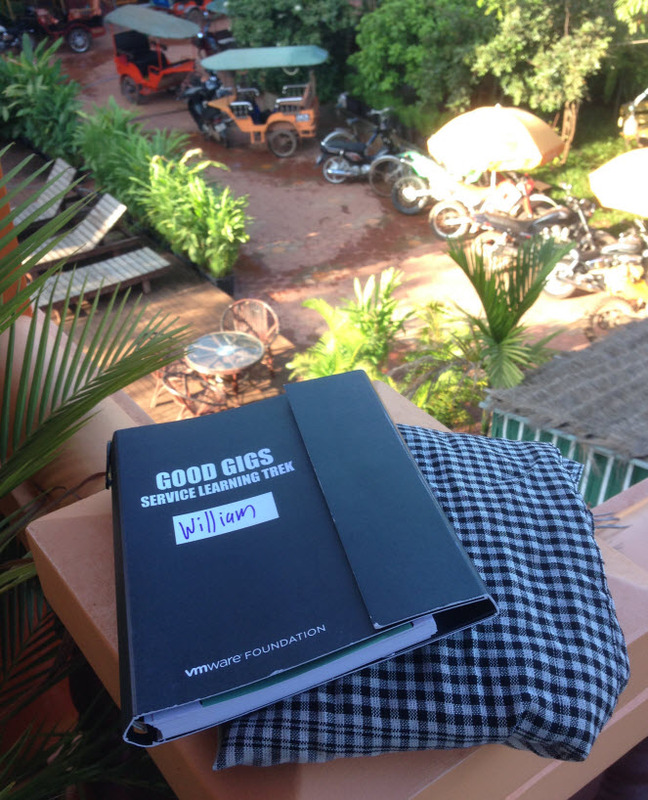 Earlier this year, the first official Good Gigs Trek took place in Vietnam which several of my colleagues: Duncan Epping and Kamau Wanguhu attended and have written about their experiences here and here. I am very honored and humbled to have been selected among eight other VMware employees (Melina McLarty, Steve Schwarze, Mike DiPetrillo, Ina Dala, Anne Holler, Uta Haller, Chirag Aurora and our fearless leader Laura Bellamy) to be given the opportunity and privilege to help serve those in need. For this trek, VMware has once again partnered up with Team4Tech which is an amazing organization that helps improve education in developing countries through innovative technology solutions. Our team was also very fortunate to have Julie Clugage, from Team4Tech join us again on this trek. On this trek, we worked with the JWOC (Journeys Within The Community) foundation to help strengthen English-language learning, digital literacy and STEAM (Science, Technology, Engineering, Art & Mathematics) programs for underserved youth and adults in Siem Reap, Cambodia. We have been working extensively for the past six weeks to gather requirements and try to better understand the needs of the JWOC foundation. Of course, no amount of preparation will prepare you for the journey we were about to embark on. In fact, we were told several dozen times to expect the unexpected and embrace and be flexible in all ways, shapes and forms. The past two weeks has really been an amazing once in a life time opportunity. For those of you interested in the Trek, below is a small recap of our first week in Cambodia. 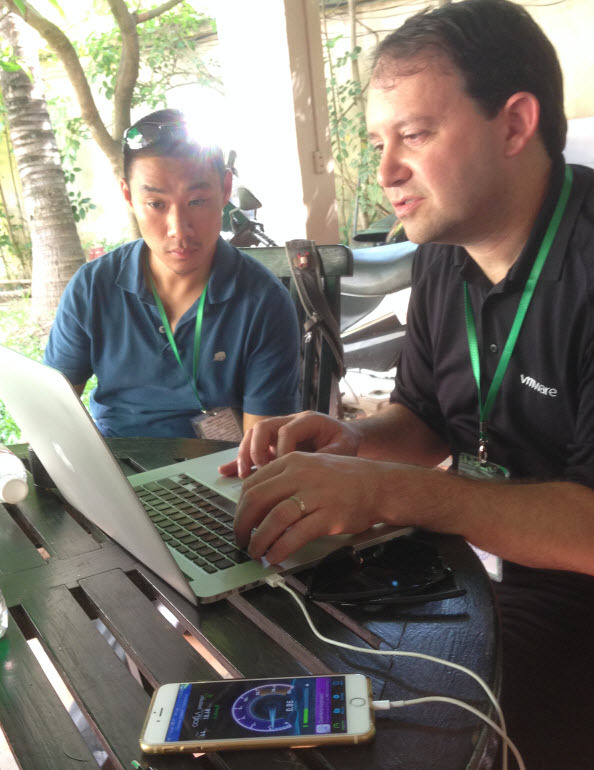 I will also be following up with another blog post recapping our second week in Cambodia. Here are the additional photos that I took during our Good Gigs Trek in Cambodia. The team had just arrived into Siem Reap, Cambodia late Tuesday evening after spending more than 18hrs+ traveling, some even longer. I probably only got a couple of hours of sleep before waking up in the middle of the warm and humid night. Luckily, our first day in Cambodia was not hitting the floor and running due to JWOC being closed on a Wednesday (open 6 other days). This provided us with an opportunity to learn more about the local community and it's people through cultural orientation and sightseeing. Our itinerary for the day was to visit the Floating Village, Angkor Silk Farm, Old Market and the Killing Fields Memorial. Before we had even left our hotel, I already had my first memorable moment when we first met our tour guide Reath Kanha who was also a previous student at JWOC. She was so happy and welcoming to everyone and had even brought each of us a gift which was a beautiful plaided colored scarf (which you can see in the picture below). She said she really enjoys wearing colorful scarfs and that it made her very happy so she wanted to share that experience with all of us. We were complete strangers to her, yet she treated us like family and I was just completely blown away by her generosity and friendliness. This really was my first impression of the Cambodian people. Throughout the day, I continued to witness the friendliness of the Cambodian people who actively said hello or waved from a distance, especially from the younger children. This was especially surprising to me, after seeing some of the living conditions in the Floating Village and learning about their tragic history of the Khmer Rouge, which was really not that long ago. You never would have expected to see so many kids smiling and playing in such conditions, yet it was completely the opposite. At the end of that day, I felt a sense of hope and perseverance from people of Cambodia. After the many weeks of preparations and conference calls, we finally arrived at JWOC! We got to learn more about the JWOC teachers and the staff through an orientation they provided us. Sitting there, listening to the staff talk about their background and experiences, the only words that came to mind was inspirational and selflessness. It was clear to me that the teachers and staff understood and valued the importance of a good education and that they truly cared for their countries' well being, especially the children's education. To improve the current economic conditions and strengthen their country, they must start with the children and ensure that they have a good education. However, just having a good education would not be enough. In addition to their Free Classes Program being offered at JWOC which includes English, Art, Science & Computer Literacy, there is also the Clean Water, Microfiance, Scholarship and The Community Liaison and Assistance programs. By providing these additional crucial services, the hope is that it should remove any barriers that would prevent the children from getting a complete education. I now understand why they named their organization Journeys Within Our Community which is quite fitting as they are doing everything they can to improve their community, the country of Cambodia. My most memorable moment of the day was when we had just returned from the computer store picking up all the new hardware. We had just finished packing everything in the van before it started to rain while heading back to JWOC. We needed to unload the hardware into the office which was towards the back of the campus and the only way in was through the front. Due to the amount of rain, we needed a way to get the van closer to office without getting the new equipment wet. However, we had an obstacle as the motorcycles and bikes were blocking the main path and not to mention vehicles normally do not go into campus. While both myself and Mike was waiting in the van, we had noticed Alex Plummer, the managing director of JWOC run straight out into the pouring rain and she started to move the motorcycles to make a path for the van to drive in. This was such a selfless act and just showed how much she cared for the kids at JWOC and that no obstacle could get in her way. This just reaffirms the passion and dedication the JWOC staff have for their students. Fortunately, the next day the weather was back to its normal and humid self which was good thing because we had a huge task ahead of us that day. The computer lab at JWOC was located on the second floor and before we could bring the new equipment up, we had to take apart the old systems and move them downstairs. This would have been a pretty daunting task if it was just between myself, Mike and Chunlay (the computer lab manager at JWOC). 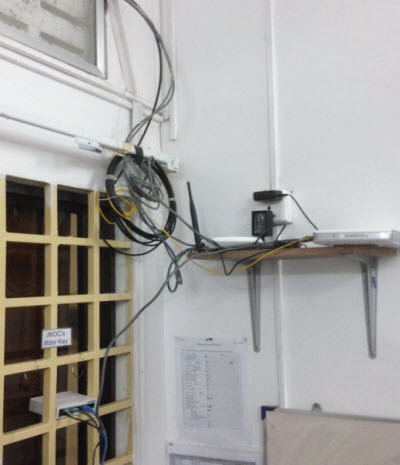 Luckily, we got some help from both the JWOC staff and the rest of the VMware team and everyone just started pitching in and helping us disassemble the old lab and we took everything down in a matter of no time. It was quite impressive to see this organic collaboration happen so seamlessly without much discussion between the two groups. Together, we also came up with the idea of creating a human conveyor belt to help reduce the inefficiencies of walking up and down the stairs carrying the new computers. I thought this was a very cool moment and everyone just had big smiles on their face, all working towards a common goal. 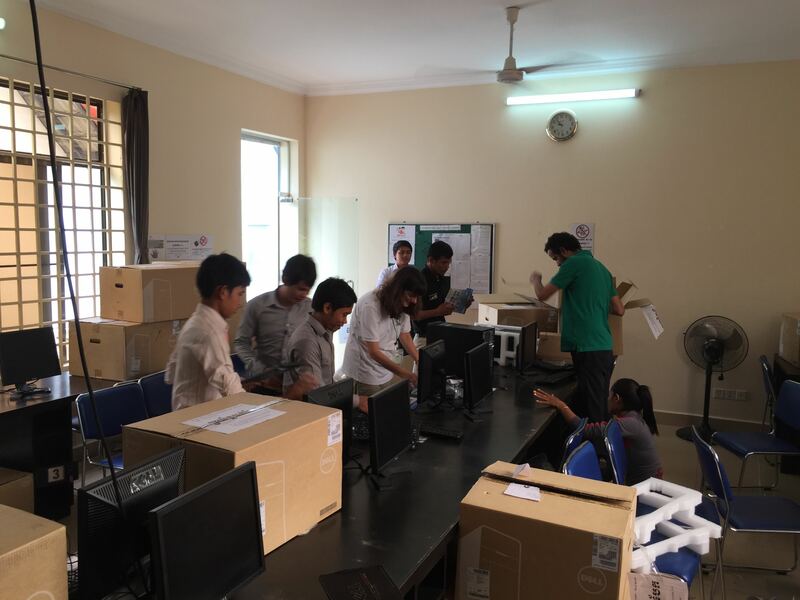 Everything seemed to be progressing quite well, the new computer lab was taking shape and the STEAM and English teams have been working hard with the teachers and training them on the new course material and curriculum that was developed. 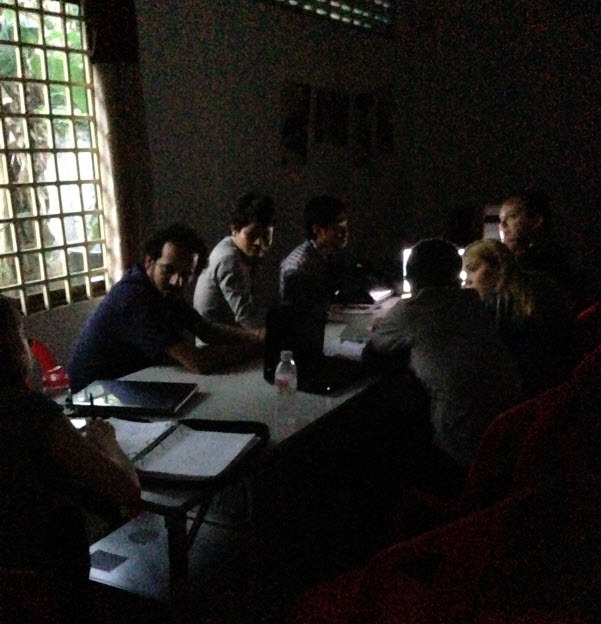 A portion of the team was in a meeting with some of the JWOC staff and all of sudden, the power just went out! This was the first of many challenges ahead of us, however everyone persevere through and Mike who was leading the presentation did not even skip a beat and continued on as he was just using his laptop which was luckily fully charged. Power outages is something the JWOC staff must deal with on regular basis and other than the computer lab, the other classes do not stop because of the lack of power. The teachers continue to teach and students continue exactly where they left off. This is the reality that many Cambodians must live with and our team rose to the challenge and got creative in light of the situation. We found out we needed to re-image some of the older systems to be re-purposed and that meant we required power and access to the Internet. Chirag, who was on the English team came up with a creative idea of leveraging his mobile phone which had a data plan and great LTE connectivity. We just needed to head into town to re-charge his data plan and start the download of the Windows 7 image which JWOC was migrating to from Windows XP. Even though the team could not get anything done while the power was out at JWOC, we could at least be prepared when the power did return. As you can see from the above picture, Mike is using his laptop to connect to Chirag's iPhone 6 and we were pleasantly surprised that we were able to get up to 20Mbps for download. Sadly, the power did not return that day but at least we were able to embrace the challenge that we were presented with. Hopefully the next day we will be more productive! Electricity returned the next day and having lost part of Saturday, the team was eager to get an early start and arrived roughly around 8am at JWOC. Everyone knew what they needed to work on and we just hammered out the work. For the SIMS (Student Information Management Systems) and Lab team, which both myself and Mike was part of, having only two people on this team meant that we had to divide and conquer. 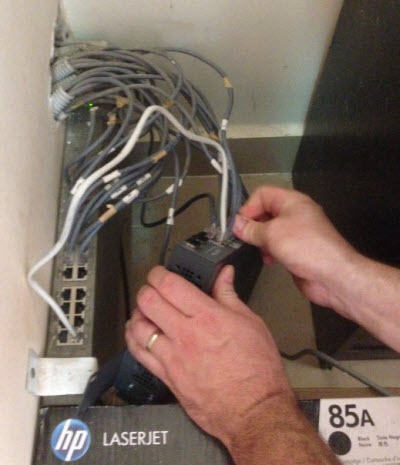 Mike primarily focused on upgrading their network infrastructure and improved their LAN connectivity by migrating their old 100Mbit switch to a new gigabit switch as well as replacing their old wireless access point with a newer unit that supported more clients and stronger signal strength. I mainly focused on getting the computer lab up and running and getting all the new software installed both on the new desktop workstations as well as couple of new laptops that were purchased. 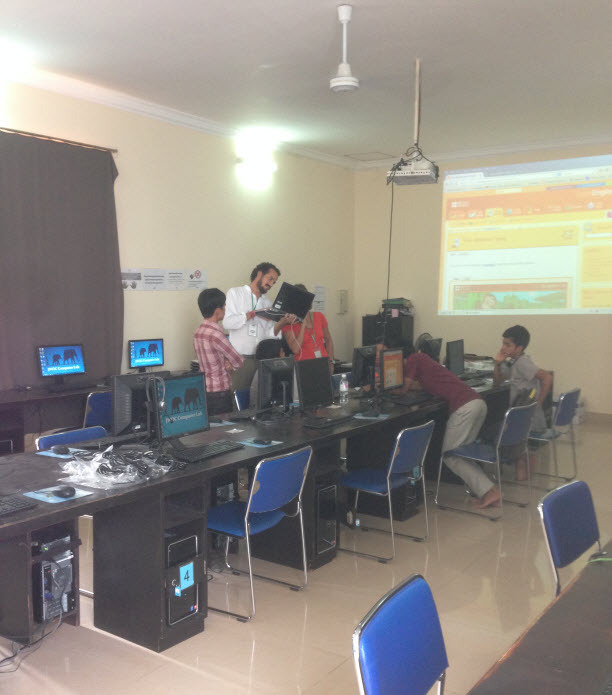 We had the computer lab up and running by mid-afternoon with the majority of the software installed which allowed the other teams to start working with the teachers on their solutions in preparation for their first classes early next week. Here is a picture of the lab with Chirag and Uta demo'ing their solutions, British Council to a couple of the teachers at JWOC. It was very excited to see everyone's engagement and curiosity! While we made some good progress that day, there was still a ton of work to be done, especially with one piece of software which both Anne Holler and myself was still troubleshooting, more on that later. The highlight of the day for me was not so much getting the lab setup, which everyone was definitely excited about, but It was actually while taking a break downstairs that I got an opportunity to learn about one of the solutions the STEAM team had developed using Lego's Education WeDo. Melina was just about to set up one of the kits and she was kind enough to allow me to help beta test the process that included building a Lego alligator that uses levers and pulleys along with a light sensor unit to open and close the alligator's mouth. 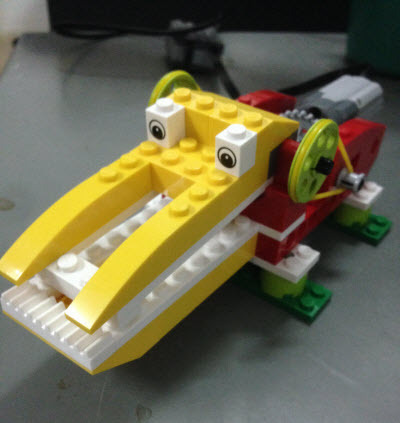 Once the Lego alligator was built, there was a simple drag/drop program (think a simplified version of vCenter Orchestrator) that the students would need to build that activated the Lego alligator. I thought this was a really cool solution that provided some basic computer literacy as well as demonstrating basic programming and best of all, it was quite fun! 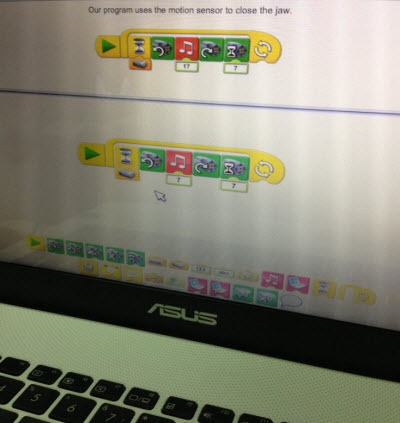 I hope the kids will enjoy the Lego WeDo as much as I did later in the week when it will be used in the Science classes. Overall, I thought we had an amazing first week! The teachers and staff at JWOC were super friendly and eager to learn from us as we did from them. Every corner of the campus, we saw kids running around and playing with big smiles on their face. How could you not be happy working in such an environment? I know everyone was definitely looking forward to the following week and stay tune for a summary of Good Gigs Week #2. 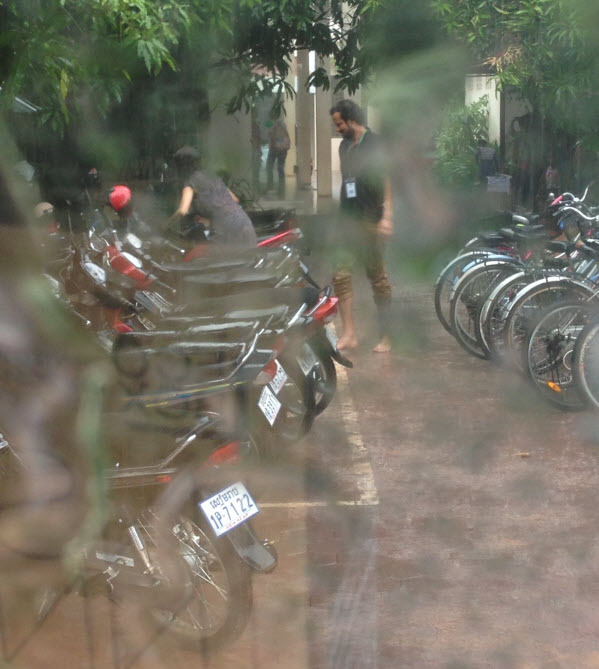 Thank you for beautifully and movingly capturing your impressions of Cambodia and JWOC. Your work at JWOC has made such a difference to the organization and its beneficiaries. Words cannot express the depth of my gratitude for your work and big heart.